Vector illustration with fish, olive oil, cheese and vegetables. Sketch design. Mediterranean traditional products in sketch style. Greek homemade traditional food on white background. Souvlaki, Tzatziki, Hummus with Pita, Grape Leaves: there’s so many delicious things to try, but such little time! Well, I’m here to help! In this article, we’ll be informing you on the top Greek foods you should definitely try when you go to Greece! Let’s start with breakfast. The popular Bougatsa is one way to start the day. Or one could enjoy Spanakopita by the beach. Spanakopita is a Greek pastry, like a dish. Spanakopita is made with filo dough, spinach, feta cheese and olive oil. Great way to start the day! You could also enjoy pastries at a breakfast buffet. Start of a new day with a bun at your local bakery. Greek coffee, also known as a Frappe by Greeks, is very strong if you love coffee and can handle strong caffeine and cocoa. That will definitely get your day started! Not all Frappes are strong, too! You could easily request, or decide, to not make it as strong, if you are sensitive to coffee. Frappes is made by placing the coffee, sugar, and 2 tablespoons of cold water in a shaker, jar, blender or drink mixer. Then it is covered and shaken well for 30 seconds, or if using a blender, drink mixer, or handheld frother, mixed for 15 seconds to produce a thick light-brown foam. Place a few ice cubes in a tall glass and you’re good to go! After a morning, or evening swim, a Horiatiki Salata is the best way to cool off and relax. Horiatiki Salata’s are both a lunch and dinner item, depending on what type of person you are. 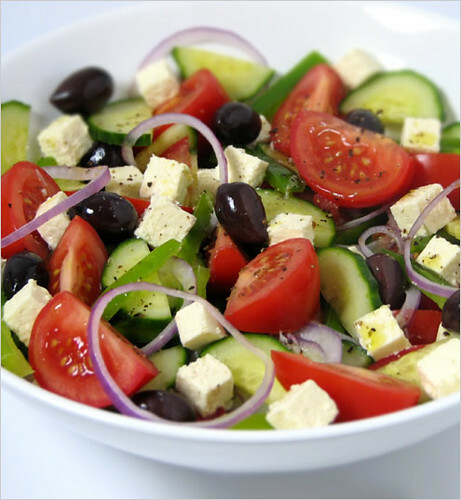 Horiatiki salads are made with olives, tomatoes, cucumbers, onions, feta cheese, bell peppers, and lettuce. If you’re not the type of person who likes salads, we have much more in store for you! A Gyro is an amazing dish if you’re hungry! Gyros are made with lamb meat, shredded or not shredded with tzatziki if you like it, and fries with ketchup! And you could even add your own things to it! Tzatziki is a sauce that is made with a yogurt base, drained chopped cucumbers olive oil and some other herbs, lemon juice and salt and ouzo. A Gyro is always a good idea! Time to get into savory! Juicy Souvlaki is a great way to end the day! 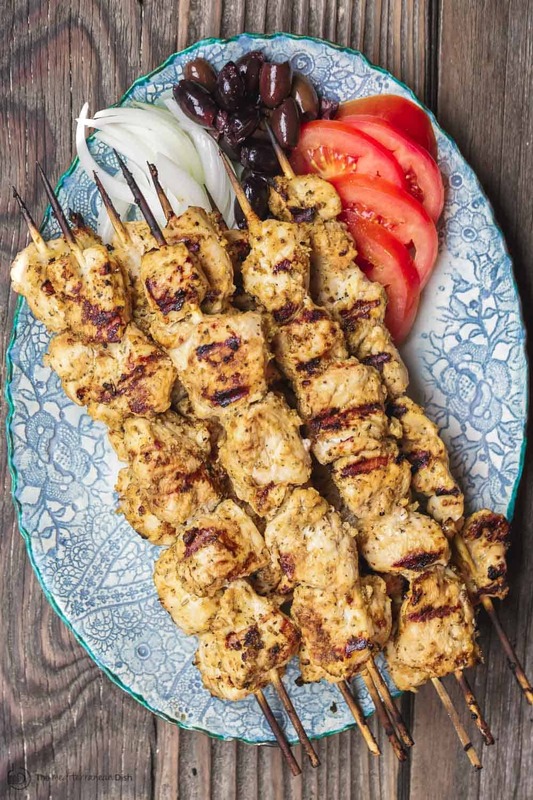 Souvlaki is grilled meat, pork, beef or chicken, usually. It is made up of small pieces of meat and sometimes vegetables, grilled on a skewer. Moussaka is an eggplant- or potato-based dish, often including ground meat. This dish was created around the 1920s. A version of this dish has an egg custard and béchamel sauce (a rich white sauce made with milk infused with herbs and other flavorings). Pastitsio is a type of pasta with ground beef. Baked savory pies which may be based on meat, fish, or pasta with cheese and/or egg as a binder and middle layer of ground beef. Grated goat cheese is often meat, fish, or pasta with cheese and/or egg as a binder and middle layer of ground beef. Grated goat cheese is often sprinkled on top. Pastitsio is a common dish, and is often served as a main course, with a small salad. Are you ready for the sugar rush? Loukoumades are pastries made of leavened and deep fried dough, soaked in syrup or honey, sometimes coated with cinnamon or other ingredients. They are known as Greek donuts. Loukoumades are little bite-sized fluffy sweet honey puffs, similar to donut holes! Tiropita are light and flaky Greek pies filled with feta cheese. They make for a wonderful appetizer or snack. Custard in Galaktoboureko may be flavored with lemon, orange, or rose. Even though Greek food takes a while to cook, and can’t be rushed if you want the best results, we hope you enjoyed learning about Greek food, and that you know a bit more about Greek culture now!